Featuring Benjamin L. Aman & Marion Auburtin, Joseph Grigely, Young Joon Kwak, Jason Lazarus, Carlos Martiel, Heather Mekkelson, Aay Preston-Myint, Rachel Niffenegger, Xaviera Simmons, Shane Ward, and Shoshanna Weinberger; with Jane Jerardi as our November Studio Resident. A publication affiliated with this exhibit—with written contributions from Antibody Corporation, Rebecca Beachy, Érik Bullot, Judith Goldman, Julia Drescher, Every house has a door (Matthew Goulish & Lin Hixson), Christy LeMaster, Valeria Luiselli, Jesse Malmed, CJ Martin, Nathanaël, Caroline Picard, Martine Syms, John Tipton, Zoe Todd, and Fo Wilson—can be found here. 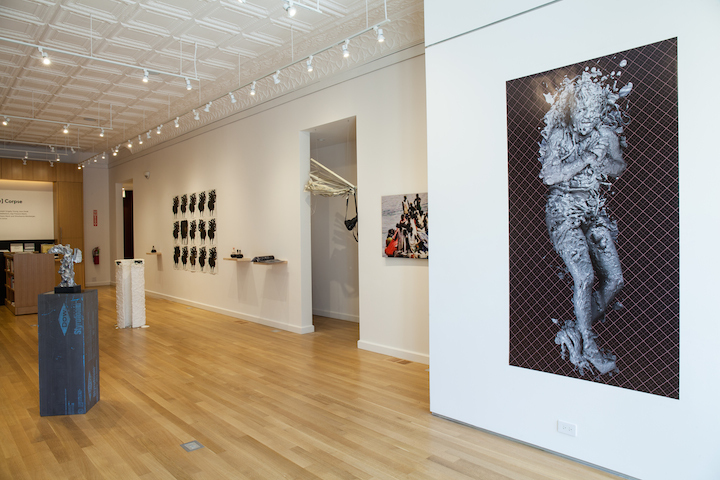 For its inaugural exhibition at Sector 2337, The Green Lantern Press presents The New [New] Corpse, a group show with thirteen artists whose work in photography, sculpture, performance, film, and drawing wrestles with representation to show how the figure appears fragmented, distorted, or emphatically absent. These artists exhume the human body to study the material networks by which it is comprised. Xaviera Simmons shows an appropriated photograph of migrants on a boat. French artists Benjamin L. Aman and Marion Auburtin present ceramic music boxes that turn like grotesque curiosities. Recent Whitney Biennial participant Joseph Grigely offers expired New York Time sclippings with the figure frozen and silent listening or mid-song. Heather Mekkelson includes the material excerpts of human activity and Rachel Niffenegger’s painted fabric hangs loose, torn and painted like a dress. Shoshanna Weinberger and Young Joon Kwak each explore an estranged and modified body, while Jason Lazarus photographs a blurred chair, emphasizing the body’s absence. Throughout each of these portrayals, representation is skewed, and unfixed — as copies of images in flux, emerging in foreign mediums that themselves have material properties: metal, cake, photography, facsimile, dust. Carlos Martiel documents a performance where he lay on ice for as long as possible, until his body temperature lowered to numbness. Shane Ward’s sculpture is a deteriorated cast of a Roman artifact, and Aay Preston-Myint installs an edible homage to utopic ideals. Within this constellation of works, a postulate emerges: the human figure is no longer defined by stable boundaries, but is rather embedded in a network of fluctuating nonhuman parts. 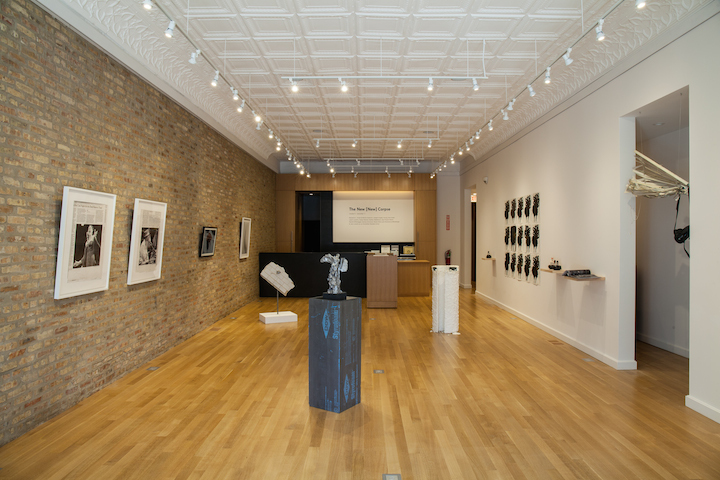 This exhibit is part of Chicago Artists Month. Our October group show, The New [New] Corpse is up until December 11th; below you’ll see the works of Benjamin L. Aman & Marion Auburtin, Joseph Grigely, Young Joon Kwak, Jason Lazarus, Carlos Martiel, Heather Mekkelson, Aay Preston-Myint, Rachel Niffenegger, Xaviera Simmons, Shane Ward, and Shoshanna Weinberger. Come by and see the show in person! We are open Wed-Sat from 2pm-6pm and later on evenings with events. Rachel Niffenegger, “Slit Witch (Night) Gown with Insignia,” 2014. 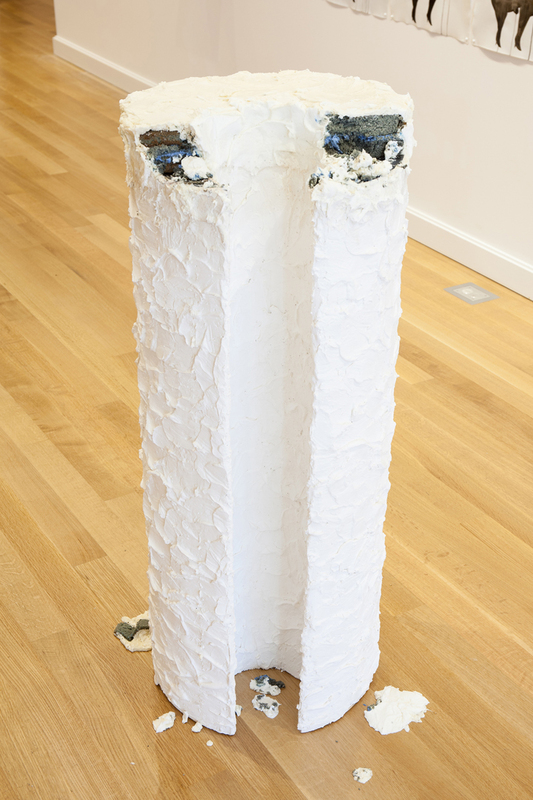 Steel epoxy, white witch costume, pig foot, acrylic, 70″ (h) x 26″ (diam). Aay Preston-Myint, “Of Their Slaves and Of Their Marriages,” 2012. Wood, metal, plaster, plastic laminate, enamel, cake, food coloring, frosting, approx. 49″ (h) x 16″ (diam). Photo by Joseph Rynkiewicz. Shoshanna Weinberger, “Posthumous Pin-Ups,” 2014. 15 ink/collage drawings on paper; 11 x 10 ft. Photo by Joseph Rynkiewicz. Benjamin L. Aman and Marion Auburtin, “Loop Island,” 2011. Ceramic and modified musical mechanism, dimensions variable. Photo by Joseph Rynkiewicz. Benjamin L. Aman (b.1981, Rouen, France) Lives and works in Berlin. Currently in residency at La Cité Internationale des Arts, Paris. Benjamin Laurent Aman is a sound and visual artist whose work oscillates between drawing, sculpture and sound, most frequently echoing each other and flowing from a range of perceptions combining a physical, a mental and an emotional approach. Using techniques of collage and spatial shifts, Aman’s constructions invite the public to travel through undetermined zones, invested by a particular sense of place where reflections and life are organized. Since 2005, Aman’s work has been exhibited in numerous group exhibitions (Centre Georges Pompidou in Paris, CAC Nei Liicht Luxembourg, Selasar Sunaryo Museum Bandung, Space London) and dedicated ones (Styx Projects, Able Kulturverein, Atelier KSR in Berlin, Kunstraum Michael Barthel in Leipzig). Since 2007, BLA has carried out many sound performances all over Europe. He has been invited to festivals and radio shows (Epsilonia in Paris, Le tétraèdre in Bruxelles, The Wire on Air, Resonance FM in London…) and performed at the 10th Berlin Biennale, Transmediale X, Club Transmediale (CTM) and Nu Substance Indonesia amongst others. In 2009, Aman founded the Razzle Dazzle label, publishing items related to fine arts and sound. Marion Auburtin (b. 1978, France) During the past 10 years, French artist Marion Auburtin has been focusing her work on painting miniatures, following a long and meticulous process of work with a maniac and distant approach. In recalling early Renaissance masters, still life, anatomical studies or film noirs images, Auburtin produces objects and paintings that toy with reversible feelings like seduction and repulsion, training and perfection, luxury and death, beauty and deformity, etc…Graduated from ENSA Nancy (Fine Arts Academy of Nancy). She lives and works in Berlin and Paris. Currently residing at the Cité Internationale des Arts in Paris, she took part in numerous exhibitions and projects in Europe like Evil Clowns (HMKV Dortmund), Perturbations (Musée Fabre Montpellier), Sleep Disorders (Nei Liicht Contemporary Art Center Luxembourg), Légère éclaircie (Galerie White Project, Paris), Equinox (Grimmuseum Berlin)… She ‘s been supported by the French Art Council twice and her work is part of several collections including: The Colas Fondation, Ravini­Bourriaud, Corréard, and Vidal. She has been selected for Le Prix Novembre de Vitry and Le Salon de Montrouge (Paris), and has had solo shows in Germany (Total gallery Berlin, Able gallery Berlin), Luxembourg (Dominique LangContemporary Art Center Luxembourg) and France (Galerie 9 Nancy). Joseph Grigely is an artist and critical theorist. His exhibitions include solo shows at the Musée d’art Moderne in Paris; The Douglas Hyde Gallery, Dublin; The Whitney Museum of American Art; and the MCA, Chicago. His group shows include the Whitney, Venice, Berlin, Istanbul and Sydney Biennials. He is represented by Gallery Air de Paris, Paris. Young Joon Kwak (b. 1984) is an LA-based artist and performer. She has had solo exhibitions in Chicago and LA, most recently at Commonwealth and Council (LA) in September 2014. She performs in the band Xina Xurner, and is co-founder of Mutant Salon. Kwak received her MFA from USC Roski School of Art & Design, MA from the University of Chicago, and BFA from the School of the Art Institute of Chicago. Jason Lazarus (b. 1975) is a Chicago based artist, curator, writer, and educator–he is currently an Adjunct Assistant Professor at the School of the Art Institute, Chicago, IL. Lazarus’ work has recently been examined by Michelle Grabner (monograph published by University Galleries of Illinois State University), Abigail Solomon-Godeau (monograph published by SF Camerawok), Shane Lavalette (monograph published by Light Work), Lori Waxman (Art Forum), and Carmen Winant (Frieze Magazine). Major exhibitions include Black Is, Black Ain’t at the Renaissance Society, Love to Love You at MASS MoCA, On the Scene at the Art Institute of Chicago, Not the Way You Remembered at the Queens Museum of Art, Image Search at PPOW Gallery in NYC, and Michael Jackson Doesn’t Quit, Part 3 at the Future Gallery, Berlin. Recent solo exhibitions include Jason Lazarus: Chicago Works at the Museum of Contemporary Art Chicago, Live Archive at the Contemporary Jewish Museum in San Francisco, and THTK (Toronto) at Gallery TPW in Toronto, CA. In 2016, Lazarus is commissioned to mount a site-specific vernacular photography installation for the re-opening of SF MOMA’s Photography Wing, this installation will become part of the SF MOMA permanent collection. Jason is a Co-Founder and Co-Editor of Chicago Artist Writers, an online art criticism platform that asks artists and art workers to write traditional and experimental criticism that serves non-profit, temporary, and alternative arts programming in Chicago. Throughout 2014, he will be screening internationally a feature length film comprised entirely of animated GIFS called twohundredfiftysixcolors, a collaboration with Eric Fleischauer. Heather Mekkelson lives and works in Chicago. Solo and two-person exhibitions include Now Slices at 65GRAND, Invisible Apocalypse at Roots & Culture; Heather Mekkelson at +medicine cabinet; Limited Entry at Old Gold; Debris Field at Threewalls; and Out Land at STANDARD (all Chicago, IL.) Her work has also been in group shows at INOVA (Milwaukee, WI), The Museum of Contemporary Photography (Chicago, IL), The Figge Art Museum (Davenport, IA), The Poor Farm (Manawa, WI), Raid Projects (Los Angeles, CA), and Vox Populi (Philadelphia, PA). Mekkelson’s work has been written about in Art Journal, Broadsheet, Time Out Chicago, New City, Chicago Tribune, Artforum.com and others. In 2012 she became an Artadia Award Chicago awardee. Mekkelson is represented in Chicago by 65GRAND. Aay Preston-Myint is an artist, printmaker, and educator based in Chicago, IL. His practice currently employs visual and collaborative strategies to investigate memory, memorial, self-reflection and self-projection within the context of queer community and history. In addition to his own work in interdisciplinary media, he is a founder of No Coast, an artist partnership that prints and distributes affordable contemporary artwork, serves as a DJ and organizer for Chances Dances, party that supports and showcases the work of queer artists in Chicago, and is editor-in-chief of an online and print journal called Monsters and Dust. Rachel Niffenegger recently returned to United States after a residency at De Ateliers in Amsterdam. While in Europe, she presented a solo show at Club Midnight in Berlin and was included in group shows at Museum for Modern Art in Arnhem and Bourouina Gallery in Berlin. She has been included in group shows at the Museum of Contemporary Art in Chicago, Tracy Williams Ltd in NYC , Asya Geisberg in NYC, Ceri Hand Gallery in Liverpool, and in Chicago at Western Exhibitions Corbett vs. Dempsey, Andrew Rafacz Gallery and the Hyde Park Art Center. Chicago Magazine named her “Chicago’s Best Emerging Artist” in 2010 and New City named her one of “Chicago’s Next Generation of Image Makers” in 2010. Niffenegger, born in Evanston in 1985, received her BFA from the School of the Art Institute of Chicago and her MFA from Northwestern University in Evanston, Illinois in 2012. Xaviera Simmons received her BFA from Bard College (2004) after spending two years on a walking pilgrimage retracing the transatlantic slave trade with Buddhist monks. She completed the Whitney Museum’s Independent Study Program in Studio Art (2005) while simultaneously completing a two year actor-training conservatory with The Maggie Flanigan Studio. Simmons has exhibited nationally and internationally where major exhibitions and performances include: The Museum of Modern Art, MoMA PS1, The Studio Museum in Harlem, The Contemporary Arts Museum Houston, The Public Art Fund, and The Sculpture Center. Selected solo and group exhibitions for 2013–2014 include Archive As Impetus at The Museum Of Modern Art; Underscore at The Aldrich Contemporary Art Museum; Open at David Castillo Gallery; Rehearsals at The Savannah College Of Art and Design; and Radical Presence at The Studio Museum In Harlem among many others. Her works are in major museum and private collections including Deutsche Bank, UBS, The Guggenheim Museum, The Agnes Gund Art Collection, The Museum of Contemporary Art Chicago, The Studio Museum in Harlem, MOCA Miami, and Perez Art Museum Miami. Shane Ward (b. 1985) is an American artist who lives and works in Chicago. Ward’s work is dedicated to themes of war and romance, capital and masculinity, violence and emancipation, surface luster and value. Ward is after the relationship between the grave and the monument, the mine and jewelry box, the wound and the mend. Of late, he has thought of this as a sustained inquiry into the nature of victory, its relationship to liberty, and its ultimate fragility. Ward earned his MFA from the University of Chicago in 2012 and received the Claire Rosen & Samuel Edes Foundation Prize for Emerging Artists in 2013. He currently teaches in the Sculpture Department at the School of the Art Institute of Chicago. Shoshanna Weinberger Born in Kingston, Jamaica in 1973 to a Jamaican-mother and American-father, Shoshanna was raised in Montclair, NJ. She currently lives and works in Newark, NJ. Her work has shown for the past decade nationally and internationallyfeatured in group shows: The New Authentics (Spertus Museum, Chicago, IL); New American Talent 18 (The Jones Center for Contemporary Art, Austin, TX); Acts of Alterity (Nomad Gallery, Brussels, Belgium); Empire (Five Myles, Brooklyn, NY); All That Glitters (The Gateway Project, Newark); Mutations (Tiwani Contemporary, London, England); America Through Artists’ Eyes (NJ State Museum, Trenton). Solo shows include: What Makes My Hottentot So Hot (Solos Project House, Newark, 2012); Sometimes All of Me is Not Enough (Carol Jazzar Contemporary Art, Miami, 2012); Potbelly Pin-Ups: Out of Many One (Woman Made Gallery, Chicago, 2014). She has also been featured in the National Gallery of Jamaica, 2012 Biennial, Kingston, JA and BIAC Martinique 2013 Biennial, French West Indies. Weinberger was featured in the Nov/Dec 2012 issue of Art Papers and awarded the First Prize in the 34th Bradley International Print and Drawing Exhibition, Bradley University, Peoria, IL (2013). Her work has been acquired by public collections: The Newark Museum, Newark, NJ; The Sagamore Collection, Miami; Girls Club Collection, Ft. Lauderdale and The Margulies Collection, Miami. Weinberger holds a BFA degree from The School of the Institute of Art in Chicago, 1995; and received a MFA degree from Yale School of Art, Yale University, 2003. Jane Jerardi is a time-based artist working in the media of choreography, performance, and video. She has created work for a variety of contexts –- from theaters and galleries to record store listening booths, public subway escalators, audio walks, and projected videos –- constructing pieces that often move fluidly between media. A frequent collaborator, she has been fortunate to work with performers Heeran Lee, Ginger Wagg, Brian Buck and Maré Hieronimus; musicians Amy Farina (of The Evens), Scanner (aka Robin Rimbaud) and Lucas Zarwell; and artists Michael Wichita and Agata Olek, among many others, on her projects. Her work has been presented by spaces such as 6018North, Defibrillator Performance Gallery and Links Hall (Chicago): the Joyce Soho, Danspace Project at St. Mark’s Church, the LUMEN Festival (in New York); and at Transformer, The Warehouse, Dance Place, and the Kennedy Center (in Washington, DC), as well as other venues. She has been fortunate to receive support from the Creative Communities Fund of the National Captial Region as well as support from the DC Commission on the Arts and Humanities through its Artist Fellowship, Young Emerging Artist, and New Media awards. She holds a MFA from the School of the Art Institute of Chicago in Performance and a BA from Hampshire College in Amherst, MA, where she studied choreography and cultural studies. She is currently on faculty and staff at The Dance Center at Columbia College, Chicago.